Looking for a 2012 calendar that features some of the most famous Alps cycling climbs in France, Italy, and Switzerland? 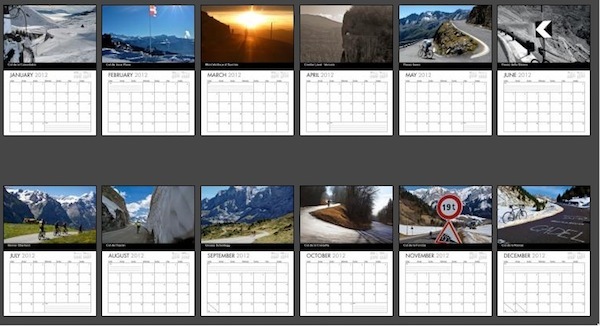 Looking for a 2012 calendar that features some of the most famous Alps cycling climbs in France, Italy, and Switzerland? I have made two. A new one for 2012. And, after lots of positive feedback, an updated 2011 Calendar with 2012 dates. Each comes in two sizes – see below. To purchase, click any of the links below and you will be redirected to the QOOP.com site – orders are placed directly with them. Here’s a video of the new calendar. Each photo in the calendar is higher quality and zoomed out. I am not (even remotely) a professional photographer. All the photos are taken using a portable digital camera. But the quality of the photos has turned out well even for the larger calendar. This is just for fun. I’ve had nothing but good feedback on service and quality from QOOP. Although American, they deliver globally and many of the 2011 purchasers were from Europe. Below is a preview of the 2nd calendar that received very good feedback last year. It’s the exact same from 2011 – with 2012 dates of course. I call it the Famous Cycling Climbs calendar. I noted you had a cow cycle shirt. Love it. My husband is cow crazy and talks to them as he cycles by. Would love to find one for him. Thanks.